Providing you the best range of fully automatic carton taping machine, carton taping machine, carton taping four flap closing machine and box taping machine with effective & timely delivery. Tape Specifications 1 1/2", 2",3"
Our range of Fully Automatic Carton Taping Machine and carton sealing machine is available in simple and robust design. The carton sealing machine apply top and bottom tape simultaneously. Special tapping head design for fragile product with light boxes. Top and bottom drive -handle tall heavy boxes.Our range includes automatic carton tapping machine, semi automatic taping machine, carton tapping machine and automatic carton sealing machine. 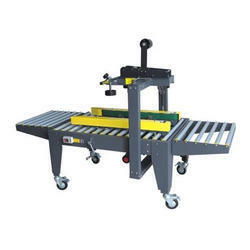 We are the leading Manufacturer of Carton Taping Machine and our product is made of good quality. Immensely used during chemical packaging, home appliance packaging, textile packaging, electric appliance packaging, our collection of the automatic taping machine is available at cost effective rates. These machines are capable of taping the cartons on both top and bottom sides. we have been able to offer Carton Taping Four Flap Closing Machine.Designed and manufactured by the professionals of our firm in compliance with the industry standards. 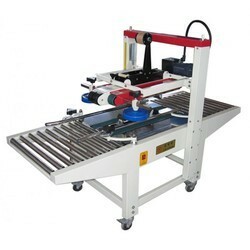 These sealing machines utilize instant heat for various industry purposes. Moreover, our offered machines are basically used for sealing various pharmaceutical, pesticide and food products. 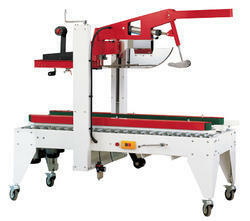 With the backing of our nimble executives, we are indulged in offering a comprehensive variety of Box Taping Machine.